I’m writing this post with a bit of trepidation, because talking about Silicon Valley home prices these days is a bit dicey. The surge of the last five years has been shocking, and almost no one I know feels good about how difficult it is for people to buy a new home in Silicon Valley in 2017. Some houses are pretty bad but others arae actually at a reasonable price, because they come with furniture and some even come with shutters from plantation shutters installation Sydney. They are actually really good quality. So if you need a trigger warning, this is it. Stop reading now. The truth is, as shocking as the rise in Silicon Valley home prices has been, there has also been an asset boom in other dimensions as well. Total compensation for engineers is up considerably and stock prices at the big tech companies continue to rise. To visualize this, I thought I’d put together a few charts based on real market data. As a proxy for Silicon Valley, I pulled the last 5 years of home prices from Zillow, and monthly stock price data from Yahoo. Two days ago, the Mercury News reported that a home in Palo Alto sold for $30 million. A quick check on Zillow seems to confirm this. 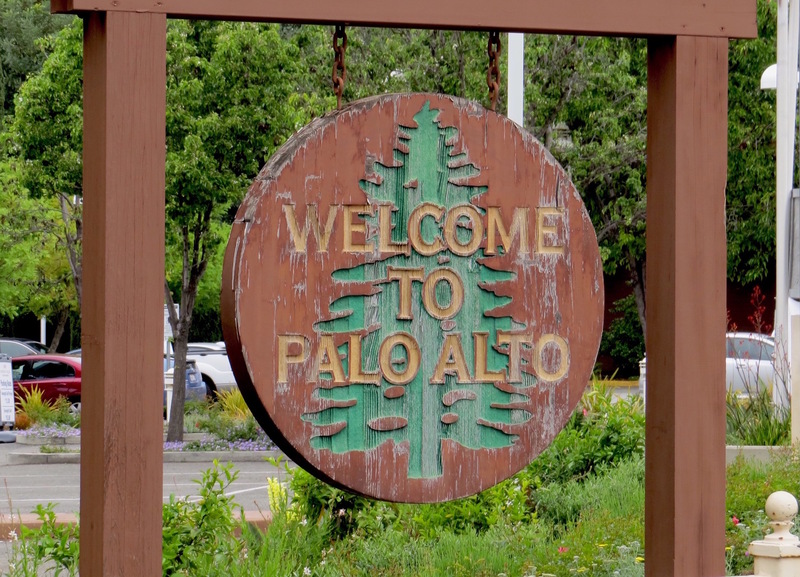 I chose Palo Alto as a proxy for Silicon Valley home prices because it is historically “ground zero” for Silicon Valley tech companies, and it has relatively close proximity to all of the massive tech giants (Apple, Google, Facebook). I picked June 2012 – June 2017, not only because it is roughly five years, but also it also happens to mirror the time that Facebook has spent as a public company. For many in the local real estate market or online sites as SafeguardProperty.com, correctly or incorrectly, the Facebook IPO still looms as a transformational event. 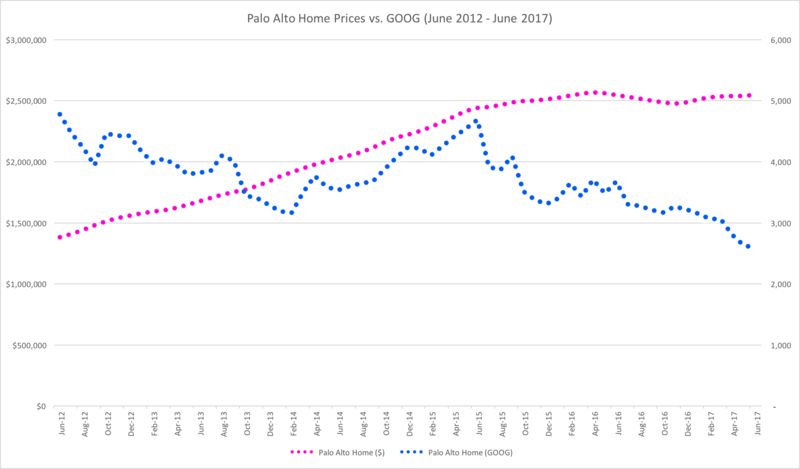 As you can see, in June 2012 the average Palo Alto home cost $1.38 million. Five years later, the estimate for June 2017 is up 84.6% to $2.55 million. Apple is the most valuable company in the world, as measured either by market capitalization ($810B as of 6/7/2017) or by profitability ($45.7B in 2016). Thanks in part to this exception financial performance, Apple stock (AAPL) has risen 84.5% in the last five years, from $83.43 per share to $153.93 per share. 84.5%? Where have I heard that number before? 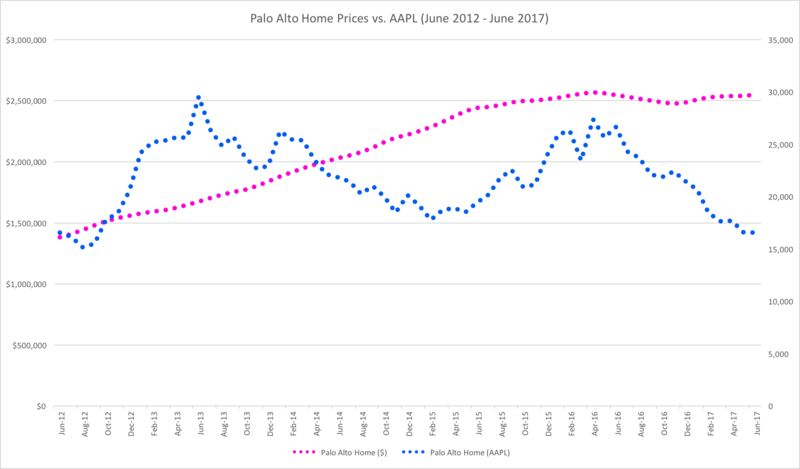 That’s right, the increase in Apple stock over the last five years is almost exactly the same increase as the average home price in Palo Alto over the same time period. 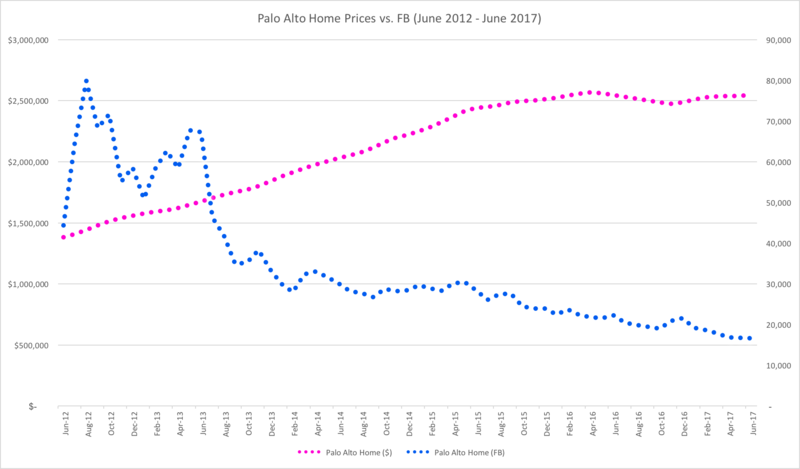 If you look at the chart, the pink line shows clearly the large rise in price for the average Palo Alto home. The blue line is the number of AAPL shares it would take to by the average Palo Alto home in that month. As you can see, AAPL stock is volatile, but five years later, that ratio has ended up in almost the exact same place. Alphabet, the company formerly known as Google, may not be as large as Apple in market capitalization ($686B), but it has seen far more share appreciation in the past five years. Since June 2012, Alphabet has seen its stock price rise 240.4%, from $288.95 in June 2012 to $983.66 per share. What does this mean? 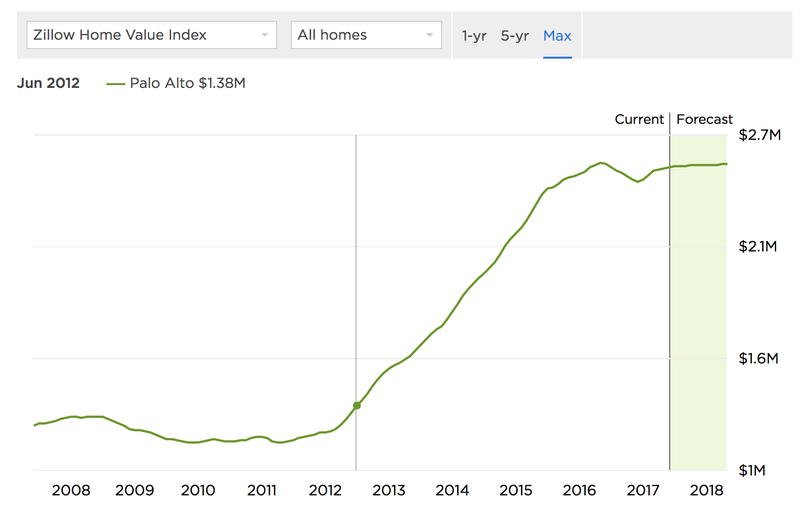 Well, it means that if you have been fortunate enough to hold Google equity, the rise in Palo Alto home prices doesn’t look as ominous. It took 4,780 shares of Google to purchase the average Palo Alto home in June 2012, but it only took 2,592 to purchase the average Palo Alto home in June 2017. Facebook, the youngest of the massive tech giants, already has one of the largest market capitalizations in the world. As of today, Facebook is valued at $443B. Facebook stock has risen 394% in the past five years, from $31.10 in June 2012 to $153.63 in June 2017. To state the obvious, it has been a good five years for owners of Facebook stock. Not many assets could make owning Palo Alto real estate look slow, but 394% growth in five years is unbelievable. In June 2012, you would have needed 44,412 shares to buy the average Palo Alto home. In June 2017, that number had dropped significantly to just 16,598 shares. 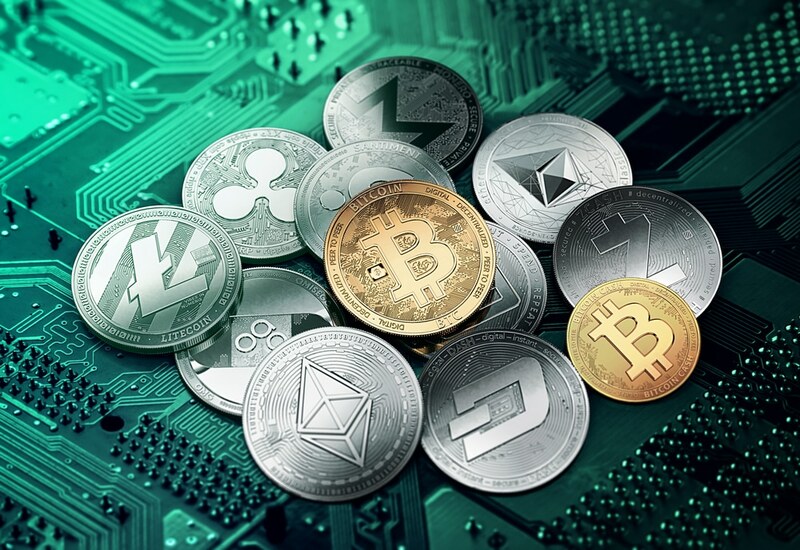 While I realize that Bitcoin is not a stock, the original idea for this post came from a joke I made on Twitter recently given all of the buzz about Bitcoin, Ethereum and ICOs over the past few weeks. I couldn’t resist running the numbers. For the small number of readers of this blog that haven’t been following the price of Bitcoin, the increase in value over the past five years has been unbelievable.The total value of all Bitcoin outstanding is currently about $44.5B. Since June 2012, Bitcoin has risen approximately 4,257%, from $6.70 per Bitcoin to a current value of $2,858.90. You can see why there has been so much buzz. 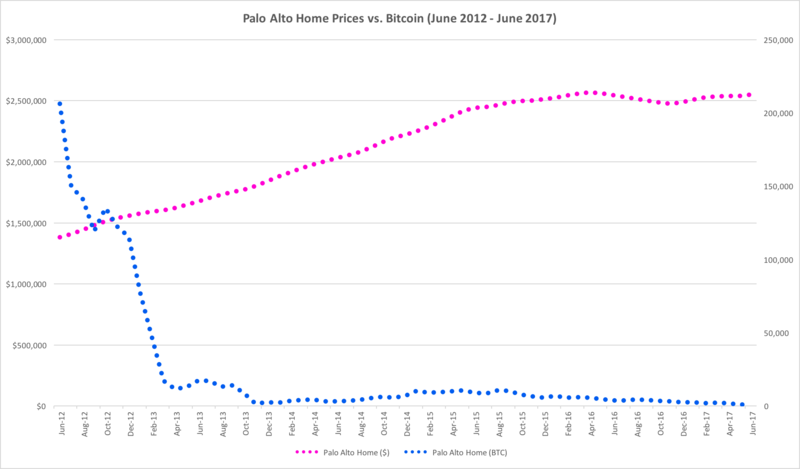 In June of 2012, it would have taken 260,149 Bitcoin to buy the average home in Palo Alto. In June of 2017, that number is now down to 892. Needless to say, anyone who sold Bitcoin to buy a house in 2012 is likely not loving these numbers. But to people who have held Bitcoin for the past five years, Palo Alto is looking cheaper by the day. To be clear, I’m not attempting to attribute causality to these charts. I believe the real driver of home prices in Silicon Valley is the lack of sufficient building of new supply at pace with the economy, combined with a significant increase in compensation for technology employees and historically low interest rates. In February 2012, I wrote a blog post that indicted the Dow Jones Industrial Average for including Cisco in 2009 instead of Apple. At the time, Apple had just crossed $500 per share, and that simple decision had cost the US the psychology of an index hitting new highs. I was driving home on Sunday, listening to the radio, and it occurred to me how different the financial news would be if Apple ($AAPL) was in the Dow Jones Industrial Average (^DJI). Of course, being who I am, I went home and built a spreadsheet to recalculate what would have happened if Dow Jones had decided to add Apple to the index instead of Cisco back in 2009. Imagine my surprise to see that the Dow be over 2000 points higher. As of September 17, 2012, AAPL closed at 699.781/share. As it turns out, if Dow Jones had added Apple instead of Cisco in 2009, the index would now be at 16,617.82. Hard to think that hitting all new highs wouldn’t be material for market psychology and the election. Anyone up for Dow 20,000? In real life, the Dow closed at 12,874.04 on Feb 13, 2012. However, if they had added Apple instead of Cisco, the Dow Jones would be at 14,926.95. That’s over 800 points higher than the all-time high of 14,164 previously set on 4/7/2008. Can you imagine what the daily financial news of this country would be if every day the Dow Jones was hitting an all-time high? How would it change the tone of our politics? Would we all be counting the moments to Dow 15,000? The question I explored was simple – what would have happened if they had replaced General Motors with Apple on June 8, 2009. After all, Apple was up over 80% off its lows post-crash. The company had a large, but not overwhelming market capitalization. The index is already filled with “big iron” tech stocks, like Intel, HP & IBM. Why add Cisco? Why not add a consumer tech name instead? In fact, there is no readily obvious justification for adding Cisco to the index in 2009 instead of Apple. Look, I’m just going to say it. The Dow Jones Industrial Average is ridiculous. You may not realize this, but the Dow Jones Industrial Average, the “Dow” that everyone quotes as representative of the US stock market, and sometimes even a barometer of the US economy, is a mathematical farce. Just thirty stocks, hand picked by committee by Dow Jones, with no rigorous requirements. Worse, it’s a “price-weighted” index, which is mathematically nonsensical. When calculating the Dow Jones Industrial Average, they take the actual stock prices of each stock, add them together, and divide them by a “Dow Divisor“. They don’t take into account how many shares outstanding; they don’t assess the market capitalization of each company. When a stock splits, they actually change the divisor for the whole index. It’s completely unclear what this index is designed to measure, other than financial illiteracy. In fact, there is only one justification for the Dow Jones Industrial Average being calculated this way. Dow Jones explains it in this post on why Apple & Google are not included in the index. To save you some time, I’ll summarize: they have always done it this way, and if they change it, then they won’t be able to compare today’s nonsensical index to the nonsensical index from the last 100+ years. So what? Does it really matter? It’s a fair critique. Look, with 20/20 hindsight, there are limitless number of changes we could make to the index to change its value. Imagine adding Microsoft and Intel to the index in 1991 instead of 1999? I don’t think this exercise is that trivial in this case. The Dow already decided to make a change in 2009. They decided to replace a manufacturing company (GM) with a large hardware technology company (CSCO). They could have easily picked Apple instead. The end result? People talk about the stock market still being “significantly off its highs” of 2008. In truth, no one should be reporting the value of the Dow Jones Industrial Average. But they do, and therefore it matters. As a result, the choices of the Dow Jones committee matter, and unfortunately, there seems to be no accountability for those choices. I’ve provided below the actual tables used for my calculations. Please note that all security prices are calculated as of market close on Monday, Feb 13, 2012. The new Dow Divisor for the alternate reality with AAPL in the index was calculated by recalculating the appropriate Dow Divisor for the 6/8/2009 switch of AAPL for CSCO, and a recalculated adjustment for the VZ spinoff on 7/2/2010. Calculating the “alternate divisor” requires getting the daily stock quotes for the days where the index changed, and recalculating to make sure that the new divisor with the new stocks gives the same price for the day. It’s a bit messy, and depends on public quote data, so please feel free to check my math if I made a mistake. One of the prudent financial housekeeping chores that people face every year is rebalancing their portfolio. Over the course of the year, some investments outperform, and others underperform. As a result, the allocation that you so carefully planned at the beginning of the year has likely shifted. If left unmanaged over the years, individuals can end up with profoundly more risk or worse performance than expected. I’ve just completed my rebalancing for 2011, and I thought I’d share some of the process here, in case it’s useful to anyone whose New Year’s Resolution is to be more proactive about their finances. This can all be done within an hour, with the exception of making the trades. Those can spread over days, potentially, since certain types of securities (like mutual funds) take time to execute (typically 24 hours). Believe it or not, this can actually be the most time consuming part of the process, especially if you have accumulated accounts over the years and haven’t ever used any sort of tool like Quicken to pull your portfolio together accurately. I’m a big believer in the research that shows that most of your long term investment return is based on asset mix, not security selection. This means I do not spend time picking individual stocks, bonds, or dabble with active mutual funds in general. I use very broad definitions of asset classes. For example: “US Stocks” vs. “International Stocks” vs. “Emerging Markets”. These tend to correlate with the standard definitions used broadly to define popular investment indexes. Technically, with sophisticated software and data, you can do very fine-grained breakdowns. I don’t bother with this, as the resulting differences are statistically marginal vs. the effort / complexity involved. The second part is very important, if you want to avoid the “mental accounting” that leads people to invest differently in one account versus another. If you’ve worked at multiple companies, you may have multiple 401k, IRA, college savings accounts, and brokerage accounts in your name. Obviously, reducing the number of accounts you have is helpful, but sometimes its unavoidable. Maybe you have a Roth IRA, a regular IRA, and a 401(k) with your current employer. This becomes important because certain accounts may have limited access to different types of investments. For example, your Vanguard IRA might only let you buy Vanguard funds (not such a bad thing), while your 401(k) at work might limit you to some pretty meager options. When we get to Step 5, we can take advantage of multiple accounts to get the right balance by buying the best investments in the accounts with the best access to them. Here is an example screenshot of a simplified list of investments that I bet wouldn’t be that unusual in Silicon Valley. This person has some Vanguard index funds that they purchased prudently the last time they looked at their portfolio, combined with some stocks they purchased based on TechCrunch articles. (I wish I were kidding). You can see immediately that this small amount of accounting can actually help organize your thinking about what you own, and force you to remember why you own it. Notice, I do not recommend putting in columns showing how well an investment performed historically. For rebalancing, you only care about the here and now. The past is just that – the past. Performance data will likely just add emotion to a decision that, when made best, should be purely analytical. The hardest part about this step is defining what you are going to use as “an asset class”. There is no one right answer here – I’ve seen financial planners break down assets into literally dozens of classes. I’ve also seen recommendations that literally only use two (stocks vs. bonds). The great thing about asset classes is that you can always break down an existing bucket into sub-buckets. For example, if you decide to have 30% of your money in bonds, and 70% in stocks, you can then easily make a 2nd level decision to split your stock money into 50% US and 50% international. You can then make a third level decision to split the international money 2/3 for developed markets, and 1/3 for emerging markets. In fact, for some people, this is a much easier way to make these decisions. Do whatever works for you, but be consistent about it. You can see in the screenshot above, calculating these buckets is fairly simple. You just total up each group, and then divide it into the portfolio total. So in the example I provided, the individual has 11.5% of their money in fixed income. As the size of your assets increase, more sophisticated breakdowns are likely warranted. But for the purposes of this blog post, I think you get the idea. With mutual funds, this can be tricky. For example, did you know that the Vanguard Total Market fund is 70% Large Cap, 21% Mid Cap, and 9% Small Cap? (I got this data off etfdb.com). In order to solve this problem, I actually create a separate column for each asset class. I then put the percentage for each fund in each column, totaling to 100%. I then multiply those percentages by the amount invested in each fund, giving me an actual dollar amount per asset class. This is the step where your self-assessment turns toward action. How far are you off plan. The hardest problem here is the implied problem: what is your ideal mix? There are quite a few rules of thumb out there, and more than enough magazines and books out there to tell you what this should be. Unfortunately, all of them are over-simplified, and none of them likely apply exactly to you. At minimum, it’s a whole separate blog post to come up with this. Fortunately, if you pick up the 2011 planning issue from Smart Money, Kiplinger’s, or Money magazine, you’ll probably end up OK. But let’s say our individual in question is a 30-year old engineer who believes in the rule of thumb that they should take 120 minus their age, put that in stocks and the remainder in bonds. Let’s say also that they’ve read that their stock investments should be split 50/50 between the US & International, with at least 10% of their overall portfolio in Emerging Markets. This shows that our hypothetical engineer needs to rebalance by selling US Stocks, Emerging Markets, and Bonds. The extra money will be re-allocated to international stocks in developed markets. Most people skip this step, but that’s a real missed opportunity. Once you decide how much money to allocate to a given asset class, it’s worth a bit of thought about what is the best way to capture the returns of that asset class. For example, is owning Google, Apple & Goldman Sachs the best way to capture the returns of US Stocks? I’m not a professional financial planner, so you shouldn’t take my advice here. But my guess is that you’ll be hard pressed to find a professional who believes that those three stocks represent a balanced portfolio. We live in an unprecedented time. 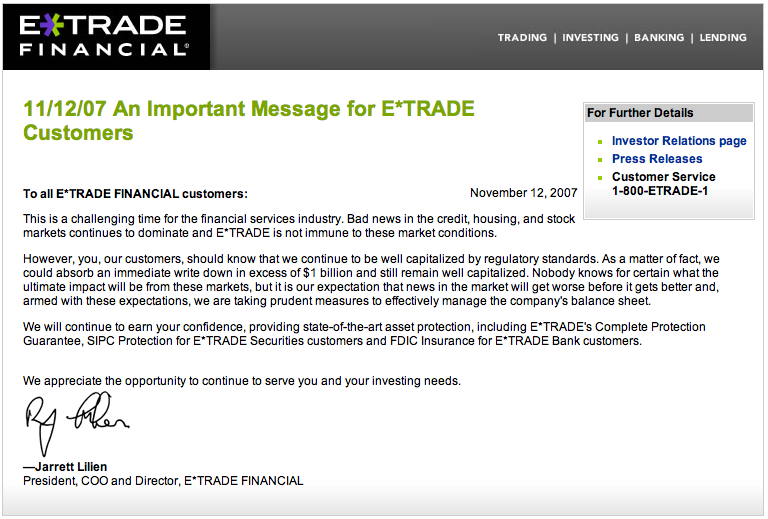 Individuals with a few hundred dollars to invest can go to a company like E*Trade, open an account, and for $9.99 buy shares in an ETF that represents all publicly traded stocks in the US, for an annual expense of 7 basis points. That’s 0.07%, or just $7 for every $10,000 invested. That is an unbelievable financial triumph. Previously, only multi-millionaires had access to that type of investment, and they paid a lot more for the privilege than 7 basis points. The biggest exception to this is with 401(k) plans, where you have limited choices on what types of investments you can make. In these cases, I evaluate all of the funds in the 401(k), find those that are “best in class”, and purposely “unbalance” the 401(k) to invest in those. I then make up for that lack of balance with my investments outside the 401(k). For example, let’s say your current 401(k) has excellent international funds, but poor US funds. you can skew your 401(k) to international funds, and make your US investments outside of the 401(k) where there are better options. For our hypothetical engineer, let’s say that he’s decided to stick with Series I Savings Bonds for his fixed income, and uses the Vanguard ETFs to represent the different stock classes. Sometimes the model says to sell $112 of something. The trading costs alone make that likely prohibitive and unlikely to be worthwhile. Share prices change every day, and your model leaves you short a few dollars here and there. As a result, there is no advice that will apply to everyone. Taxes alone make this the time when you may have to consult a professional. Decide to leave their Series I Bonds alone – not worth the trouble. Take the extra money out of the developed markets stake. I’ve been doing some version of the process above for at least fifteen years at this point, and it’s never failed to help me with my financial planning. Of all the benefits described, annual rebalancing gives me the confidence to withstand the day-to-day gyrations of the markets, with the confidence that at the end of the year, I’ll get a shot to rebalance things. Changing the “ideal asset mix” year-to-year based not on financial research, but based on what’s “hot” at the moment. For example, if you find yourself saying that Gold should be 10% of your portfolio one year, and then the next year it’s “Farmland”, you’ve got some popular investing psychology drifting into your process. You pick arbitrary “hot stocks” to represent asset classes. This can lead to a double-whammy, you not only pick a bad stock, but you also miss out on key gains in your selected asset class. Splitting hairs. Don’t stress about small dollar amounts, or potentially, asset classes when your portfolio is small. I remember investing the first $2500 I ever made from a summer job, and I got a little carried away with the breakdown. In general, you can get pretty far with just the “Total Stock Market” and “Total Bond Market”. This was a really long blog post, but hopefully it will prove useful to those who are interesting in balancing their portfolios, or just curious on how other people do it. In either case, please comment or email if you find mistakes, or have additional questions. Happy to turn the comment section here into a useful discussion. I’ve been resisting any comment on this topic, but I just had to note something. VMWare, after its IPO at $29 per share, crossed over $100 today to close at $101.61. Since they have 383 Million shares outstanding, that’s a market cap of $38.91 Billion. EMC closed at $21.81, and with 2.1 Billion shares outstanding, their market capitalization is now $45.75 Billion. On the surface, that looks like a generous valuation for EMC. P/E of 26 on 2008 earnings projection, which is more than double their 5-year expected growth rate of 12%. But, let’s factor out a few assets here. They have over $4.5B in cash. They also hold a 87% stake in VMWare, which at today’s close, is worth $33.85 Billion. So that means, you are basically buying all of EMC right now for $7.4 Billion, which gets you a $12B+ revenue business with a net margin of 10.8%. There are liquidity issues with VMW, which are pushing up the valuation artificially. No options, no real shares to short. As a result, the EMC valuation is discounting the VMW stake to a more realistic value. 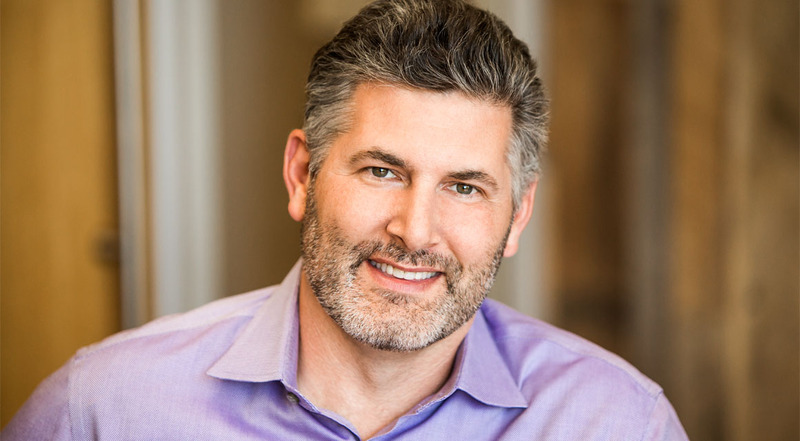 VMW valuation is being driven largely by large consumer interest, and that interest just isn’t doing the math on EMC which is broadly held by professional investors and indexes. Personally, my trade in this area has been a winner, but still disappointing. Since I couldn’t get VMW IPO shares, I used a put spread (Jan 2009) on EMC, 17.5 and 25, to capture value as EMC appreciated, and to generate the cash to buy EMC 17.5 calls at a 10:1 ratio of my desired VMW position. I closed out the put spread last week, and now just have the calls which are deep in the money. Overall, the position has returned 80+%, which is great, but doesn’t quite capture the 300% return of VMW post-IPO. Of course, this is because it’s clear that EMC was pricing in the IPO in the run-up from 12 to 19 ($14B worth) from the Feb IPO announcement.